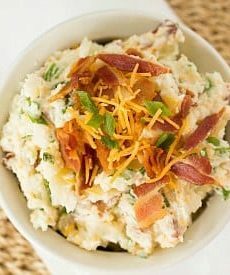 Loaded Baked Potato Salad combines all the best flavors of an amped-up baked potato: sour cream, bacon, cheddar and green onions. Preheat oven to 425 degrees F. Bake the potatoes for 45 to 50 minutes, or until tender and cooked through. Set aside to cool completely. Once potatoes are completely cool, cut into ½-inch pieces. In a large bowl, whisk together the mayonnaise and sour cream. Add the potatoes, bacon, cheese, green onion, salt and pepper, and fold together gently with a rubber spatula until completely combined. Cover and refrigerate for at least 4 hours before serving. Garnish with additional bacon, shredded cheddar and green onion, if desired.